View of the Davidov Glacier and waste rock from the mine on it. owned by Canadian mining company Centerra Gold Inc.
the Kyrgyz Republic now owns 33 per cent of Centerra Gold Inc. 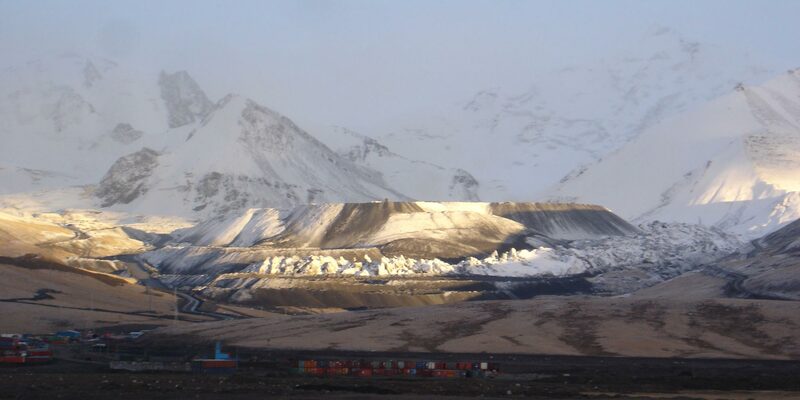 The mine threatens the fragile glacier environment with hot waste rock stored on top of ice, causing it to melt faster. A possible overflow at the upstream dam could lead to waste chemicals from the mine to be washed downstream. Long-term release of contaminants from current and future mining operations. Several accidents at the mine have left several people dead and hundreds in need of treatment. The Kumtor open pit gold mine is located in a remote area of the Tian-Shan mountain range in Kyrgyzstan at an altitude of 4000 metres, next to the Sarychat-Ertash reserve and not far from the Issyk-Kul lake, an important regional tourist attraction. The mine is being developed in fragile conditions of permafrost and in the vicinity of glaciers that feed fresh waters into the transboundary Naryn River. It is an area of surreal beauty. Waste rock on the glaciers. 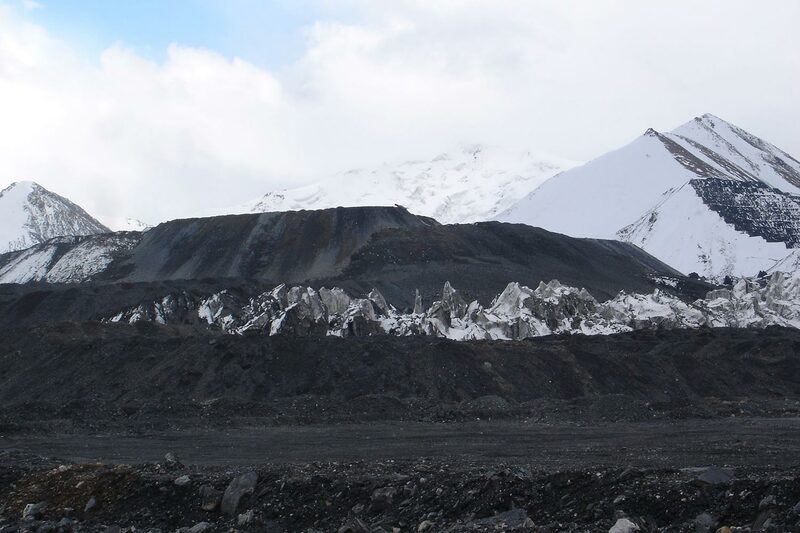 The mine pit slices through two glaciers (Lysyi and Davidov). This vicinity and the practice of storing waste rock directly on the glaciers damages these enormous natural ice sheets. 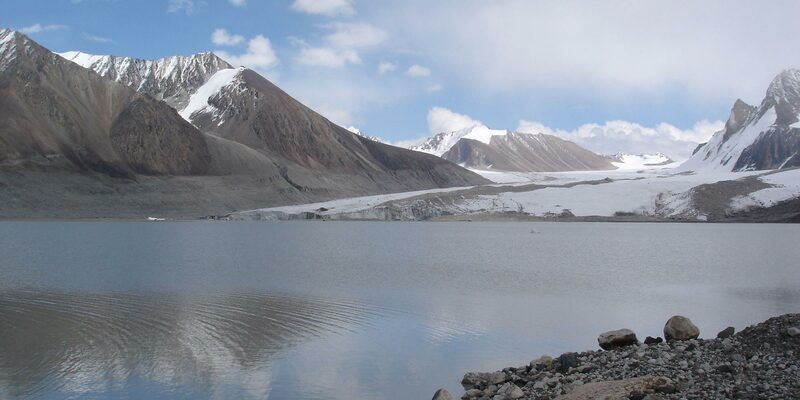 The glaciers, already suffering from the impacts of climate change, are melting much faster and have shrunk tremendously in recent years, as Kyrgyz scientists have confirmed us. The mine’s tailings (i.e. chemically polluted leftovers) are located below Lake Petrov. The lake grew by more than 92,000 square metres annually in recent years due to a melting glacier. The lake’s natural dam has become less and less stable (according to Torgoev Isakbek, author of a State Commission report on the subject). Although there is no imminent danger, the lake’s tremendous growth might cause it to break out at some point. In a worst-case scenario, the downstream tailings could then be washed away, with unforeseeable impacts on the environment. The tailings dam foundation is also experiencing horizontal deformations and is moving down the slope . Inspite of measures to stabilise the dam in 2003 and 2006 (so-called shear keys and toe berm), the dam is still continuing to move. Kyrgyz scientists believe it is caused by the facts that it has been built on an uneven slope and that the dam never freezes. During summer operations (May through October) some five million cubic metres of waste water from the tailings are treated and discharged into the Kumtor River and eventually flow into the Naryn River (later Syrdarya) towards Tajikistan, Kazakhstan, Uzbekistan. While Centerra Gold Inc. does not publicise data on the quality of the discharged water, people living near the Kumtor River observed an enormous decrease in fish stock in recent years and suspect that the river has already been polluted. The seasonal glacier melt-waters and the ground water flow into the mine’s open pit at a rate up to 1000 liters/sec . After contact with the rock, the water becomes chemically-degraded and is then pumped out and discharged to the environment. See photos from our investigations in Kyrgyzstan on flickr. Download the report by hydrogeologist Dr. Robert Moran Kumtor gold facilities, Kyrgyzstan: Comments on water, environmental and related issues (pdf). Centerra Gold has been the client of the EBRD since 1995 and the bank has failed to ensure that its client respects public social environmental concerns and social needs. collapses of a 200 metre high pit walls at the mine in 2002 and 2006. While the company plays down the cyanide spill in 1998, more than 1000 people have turned to the Barskoon local public association “Karek” in need of assistance to protect their rights and to claim compensations for the damages caused by the spill. A law suit is ongoing since 2005. 24 Barskoon villagers with documented proofs of poisoning demand compensation for moral and health impacts from the mining company. The company did not notify residents of Barskaun, who use the water for drinking and irrigation, until 5 hours after the accident. As a result, over 2,500 people were poisoned, 850 people were hospitalized and at least four of those patients died. Villagers stage a blockade to demand proper compensation for an old accident at the Kumtor gold mine. Land, forests, water and raw materials are valuable resources that increasingly interest the major players of the economy of our planet. 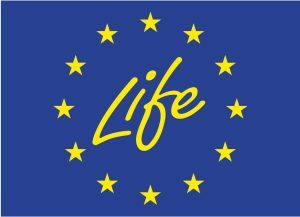 This report collects 16 case studies from around the world in order to better understand the impacts of natural resource grabbing on the local communities, clarify the responsibilities of the European Union and, in conclusion, examine actions to be undertaken to invert this phenomenon.